Rift between the ruling BJP and its coalition partner IPFT in Tripura came to fore on Monday. The IPFT resorted to block the Agartala-Khowai road in front of Lefunga block office. Their demand is to nominate an IPFT member as the new chairman of the Block Advisory Committee. 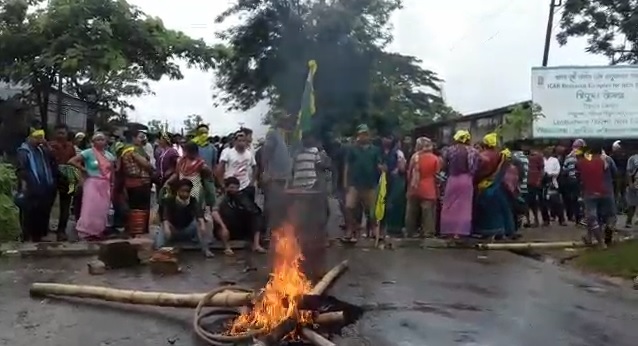 IPFT agitators who had locked the Lefunga block office earlier had blocked roads and called an indefinite strike in that area until their demand is fulfilled. The agitators burnt tyres on the roads and raised Twipraland slogans. The agitators alleged for last 28 days they have been raising this issue to bring it to the notice of the government but the local MLA Ratan Lal Nath who is also the Education and Law Minister has nominated his trusted ally as BAC chairman. The agitators threatened to continue their agitation until their demand is fulfilled. Meantime, large numbers of police personnel have been deployed in the area to avoid any untoward incident.